The fog-busting crew at Oregon's Medford Airport gets ready to clear the air. Make-believe fog is a frequent special effect used in the theater and at rock concerts. Usually created with dry ice, frozen carbon dioxide crystals, the smokey mist rolling across the stage creates a sense of mystery and suspense. But when real fog settles over an airfield, it creates delays or even danger. At an airport in the western state of Oregon, ground crews take matters in their own hands when freezing fog threatens to delay takeoffs and landings. And they use the same substance to clear the fog that's used to create it - dry ice. "The dry ice collects the moisture [in the air] and it falls to the ground as basically just snow or ice," explains Howard Volkman, the operations and maintenance supervisor at Rogue Valley International-Medford Airport. When Mother Nature throws travelers a curve ball and freezing fog descends over the airport, he and his co-workers jump into action. First, they load crushed dry ice into a hopper suspended under a big helium balloon. The five-and-a-half-meter-diameter balloon is tethered with a winch cable to an airport pickup truck. The crew lets it rise to 152 meters, then, with a remote control, turns on the dry ice spreader. A driver and an operator make slow loops around the runway with the balloon and its dry ice spreader in tow, scattering the crystals into the mist. "We're clearing a hole in the fog," Volkman says, "just for the airplanes to be able to see the runway." The staff nicknamed their white balloon CASPER, after the friendly cartoon ghost. Then they came up with an acronym that fit: Cable Attached System Providing Effective Release. With the dry ice spreader loaded, CASPER is ready to be launched. CASPER first took to the air in 2010, and has deployed 14 times this winter. Medford Airport Director Bern Case says it is "very effective," reducing flight cancellations to near zero. "It's all about dollars. Cancellations and diversions for airlines are very expensive, not only to the airlines, but if a person is trying to get to Tokyo and they can't get out of here, it can ruin an entire trip," he said. This fog-busting method only works at temperatures of zero Celsius and below. So it is not that useful for airports in coastal cities where it's usually warmer when fog forms. 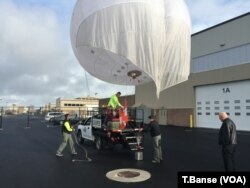 Case says the Medford airport provided the blueprints for the one-of-a-kind balloon system to the airport authorities in Spokane, Washington and Anchorage, Alaska. International inquiries about Medford, Oregon’s fog-clearing technology have come from Russia, South Africa and Scotland. While fog-clearing operations are still necessary for private planes and older aircraft, recent advances in precision navigation technology mean newer jets can take off and land with barely any visibility.